I spend about an hour a day shoveling manure out of eight horse stalls. Wheeled to a mountainous pile in our barnyard, it happily composts year round, becoming rich fertilizer in a matter of months through a crucible-like heating process of organic chemistry, bacteria and earthworms. Nothing mankind has achieved quite matches the drama of useless and basically disgusting stuff transforming into the essential elements needed for productive growth and survival. I’m in awe, every day, at being part of this process. The horses, major contributors that they are, act underwhelmed by my enthusiasm. I guess some miracles are relative, depending on one’s perspective, but if the horses understood that the grass they contentedly eat in the pasture, or the hay they munch on during the winter months, was grown thanks to their carefully recycled manure, they might be more impressed. Their nonchalance about the daily mucking routine is understandable. If they are outside, they probably don’t notice their beds are clean when they return to the stalls at night. If they are inside during the heavy rain days, they feel duty-bound to be in my face as I move about their stall, toting my pitchfork and pushing a wheelbarrow. I’m a source of constant amusement as they nose my jacket pockets for treats that I never carry, as they beg for scratches on their unreachable itchy spots, and as they attempt to overturn an almost full load, just to see balls of manure roll to all corners of the stall like breaking a rack of billiard balls in a game of pool. Good thing I’m a patient person. So my stallion discovered a way to make my life easier rather than complicating it. He hauled a rubber tub into his stall from his paddock, by tossing it into the air with his teeth and throwing it, and it finally settled against one wall. Then he began to consistently pile his manure, with precise aim, right in the tub. I didn’t ask him to do this. It had never occurred to me. I hadn’t even thought it was possible for a horse to house train himself. But there it is, proof that some horses prefer neat and tidy rather than the whirlwind eggbeater approach to manure distribution. 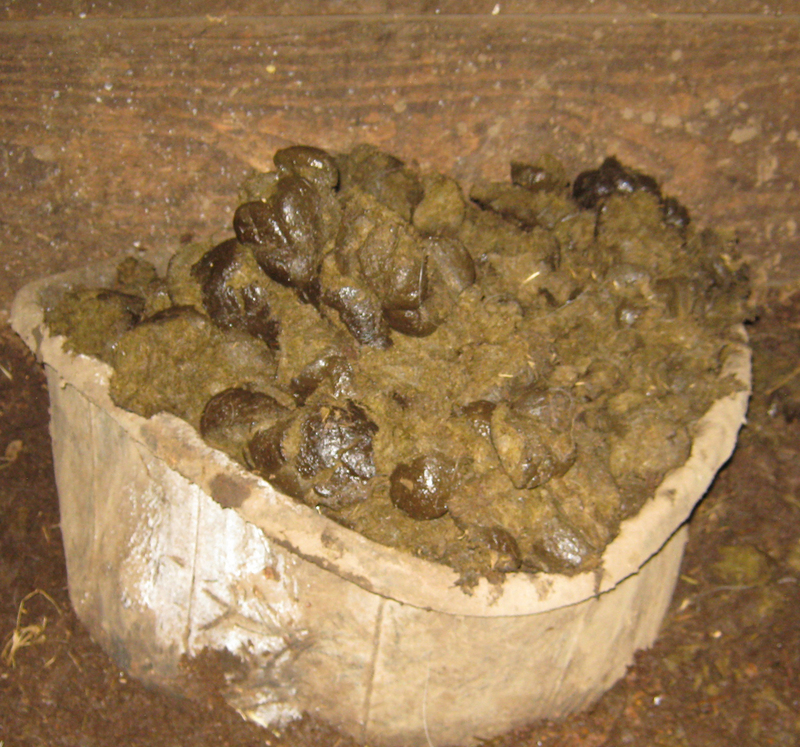 After a day of his manure pile plopping, it is actually too heavy for me to pick up and dump into the wheelbarrow all in one tub load, but it takes 1/4 of the time to clean his stall than the others, and he spares all this bedding. What a guy. What a story!!! I love it!!! My brother-in-law in Mississippi had a mule a number of years ago who thoughtfully deposited daily waste in ONE spot in a pasture of a couple of acres. There was a barn, too, but the pasture sported no ultra-green spots scattered around — just the one pile in the corner of the pasture, close enough to the three-wire fence that a wheel barrow could be parked out side and the manure shoveled through the wire. Get out! Your HORSE is POTTY TRAINED?! I am in awe. Ahahaha! That’s so cute, he must really love you! What a good story and what an intelligent horse you have there! Actually I had to take my haffies into their stable stalls again one day before I had a chance to clean out – probably for hoof-trimming – and they were so surprised. They smelled every heap and looked quite dismayed. So I would say they’d notice. My gelding thought it was great fun to turn over the wheelbarrow when he was young, too, especially in the turn-out barn. Please let us know when your beautiful stallion is ready to move into the house! Folks debate what traits the stallion passes on, and which the mare. I am not sure, but just in case, I would breed to this stallion! I am sure he has lots of other things in his favor, but this one is a selling point for sure! !